What secret stuff have you guys found? What do you wish to see in the next update??? Well because we have to wait for bucket to update, I doubt we’ll be updating the server for a while. I know this will make some people angry, but there’s nothing we can do about it. The bucket devs have lives they attend to and work on it when they have time to, so please be patient while they work on it. 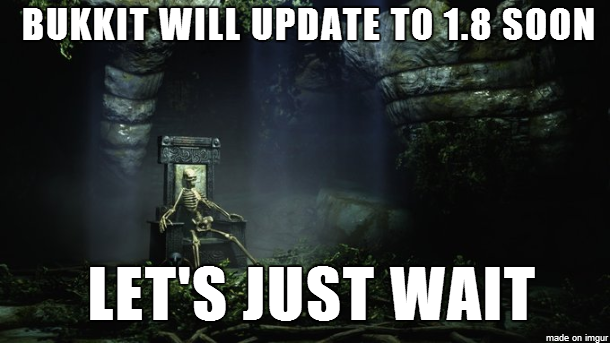 It will take some time for them to get everything to the point where we will update the server. You can’t silence the truth! But anyways, I personally am not hoping for anything in particular. Maybe a fix for the Advanced OpenGL bug where chunks just randomly stop loading properly. Other than that, I got nothin’. It would be nice if I could render farther than 16 chunks online like you can in single player. I never thought of that… That’d be perfect! Like I would play Minecraft without optifine, lol. You can set it further, but the game limits multiplayer distance vs single player. Optifine even says anything past 16 will not affect anything online, only single player. But since yesterday I can only get 40fps max due to running SEUS mod. (Sonic’s unbelievable shades mod) So I can’t really go past 16 chunks anyway ATM. Lol. I love Optifine. It really smooths things. What I really want is for Jeb to re-code Minecraft in the same coding used on PS3 and Xbox so that the game wouldn’t need optifine on so many machines. From what I’ve of the two versions, they are much smoother and less buggy, and maybe even easier to work on. So yeah, better coding would be cool!